MPI Home Video's new subsidiary label, Dark Sky Films, has been making their presence known of late with a number of interesting, offbeat releases on DVD. Among them are the early gore classic THE FLESH EATERS (1963) with Martin Kosleck, the anime-like TERROR BENEATH THE SEA [Katei daisenso, 1966] with Sonny Chiba, the Edgar Wallace krimi THE COLLEGE GIRL MURDERS [Der Mönch mit der Peitsche, 1967], and the R-rated drive-in favorite WEREWOLVES ON WHEELS (1971). Another of their releases, a bit harder to find than the others, is a curious item titled WET ASPHALT, starring Horst Buchholz, Maria Perschy (both pictured above), and Gert Fröbe. Dark Sky has labelled the release as "Lost Noir" -- but there's got to be a better name for it than that. For one thing, WET ASPHALT is a German picture. Originally released as Nasser Asphalt in 1958, WET ASPHALT was distributed here in the United States by Walter Manley Enterprises, best-known for importing an especially kooky brand of science fiction film -- PRINCE OF SPACE and INVASION OF THE NEPTUNE MEN , to name a couple. Its release as a Dark Sky title hints at the phrase "contractual obligation" and it might well have been a contractual obligation for Manley too, as it's hard to imagine it ever selling many American tickets on its own. That is not to say that it's not good or not interesting; on the contrary, I was drawn to this release right away, without quite knowing why. As one quickly surmises from the DVD's sketchbooky cover art, WET ASPHALT is not really a noir film at all -- it isn't a crime picture, per se, nor is it particularly stylized; it doesn't feature hardboiled male characters nor femmes fatale. So why did it continue to beckon to me, long after I had set it aside for later viewing? True, it has some cast and crew members with minor cult appeal, but I believe what most intrigued me is that it reminded me of other unclassifiable works from the same era and area. This led me to the consideration that there may well be a worthwhile kind of European film, largely forgotten now, that has been overlooked precisely because they are not allied to genre. Of course, these films could be said to fall under the basic generic heading of drama or love story, but I would argue that they are a certain kind of drama and love story in need of their own distinctive term. After all, because movie thrillers already existed, that didn't prevent the giallo from being pinned and labelled as something distinct, right? What do I know about these strange, disenfranchised movies? They are European -- primarily German, French, Swiss, Czech or Yugoslavian; they are movies that, though well-made, didn't have the artistic gunpowder or pretension to make an international mark as art films; they are also mainstream pictures that, in every way other than story, seem to scream genre. They are not really atmospheric but they have mood in spades; they are neorealistic in terms of their look and their frankness about controversial subjects, yet they are decidedly more artificial, more movie-like, than, say, Italian neorealist pictures. Furthermore, they seem to be commonly steeped in post-war feelings of guilt, self-reproach, and sin by association. They make me think of the Gene Pitney song "Town Without Pity" -- written by Dimitri Tiomkin and Ned Washington for the movie of the same name, which was set in the West Germany of 1961. I'm determined to find a generic handle for these movies, because if they become known as belonging to a specific genre, they stand a better chance of surviving, being re-released, and being discussed. There may also be a few buried masterpieces among their kind. When I was a kid, I occasionally saw trailers for films like WET ASPHALT at the drive-in, or at a neighborhood indoor theater that hosted kiddie matinees on weekends and catered to the "art film" market on weeknights. They always mystified me because there was an air of otherness about them that I knew ought to interest me, but they didn't promise the monsters and mayhem that would have encouraged me to seek them out. There was also a palpable sense that these movies were for adults. Consequently, my main memory of them is that I saw the trailers, but the movies themselves never materialized. Sometimes these trailers turn up on Something Weird Video compilations; they feature actors like Curt (or Curd) Jurgens, Maximillian Schell, or the star of this particular film, Horst Buchholz. 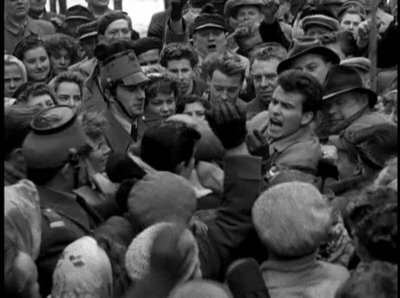 Some years before he made WET ASPHALT, Buchholz starred in another German picture called Die Halbstarken (1956), which was released in America under the title TEENAGE WOLFPACK. I wish I could remember the name of the Something Weird compilation that featured its trailer -- watching this compilation was like dreaming while wide-awake, because the names of the actors were familiar but the films were so obscure they all seemed imaginary! The trailer for TEENAGE WOLFPACK stood out because it humorously "introduced" Buchholz as "Henry Bookholt" -- a new sensation of the screen. TEENAGE WOLFPACK (whose title may well have helped inspire the "True Confessional" title for I WAS A TEENAGE WEREWOLF in 1957) looked like it would belong to the same obscure, disenfranchised pack of Eurodramas as WET ASPHALT. In hindsight, I suppose these films must have appealed to two basic groups of Americans in the 1950s and early 1960s: 1) immigrants to whom the European settings and actors were familiar, and 2) curiosity seekers who detected in these trailers a whiff of the unknown, the forbidden, the un-American. In other words, somebody might get naked. Anyone hoping for a glimpse of forbidden fruit in WET ASPHALT will be disappointed, as it is actually a study of a young journalist and the conflicts that arise from his moral code. Buchholz plays Greg Bachmann, a young reporter who was sent to prison for six years for impersonating a French officer to infiltrate Spandau Prison and gain exclusive interviews with the most notorious of surviving Nazi war criminals. Upon his release, he is approached by Cesar Boyd (Martin Held), Germany's one-man news industry, who respects what Greg tried to do and needs an assistant; he offers him top dollar for his services. Narration carries us four years further down the road of their association. Boyd has maintained his stellar reputation and Greg is delighted to be working with him. Distracted by the arrival of Boyd's pretty niece Bettina (Perschy), the two journalists forget their obligation to file a strong weekend story with the leading Paris newspaper by 8:00 on Friday night and need to come up with something fast. Desperate, with the help of his chauffeur Joe (Gert Fröbe in the earliest of his screen appearances I've seen), Boyd concocts a far-fetched story about a group of Nazi soldiers and their prisoners being found alive in a Polish bunker, where they have spent the last six years -- and presents it to Greg as factual. Greg calls it the greatest news item he's ever heard, and to Boyd's astonishment, the world agrees. The story captures the world's imagination and the demand for further details pushes him to invent further updates. The location chosen for the bunker happens to coincide with a spot in Poland where secret rocket tests are being conducted by the Russian army, and the story excites unwelcome interest in the region, resulting in grave impact on other peoples' lives. The demand for additional news becomes so great, and so lucrative, that other unscrupulous professionals begin to heap their own facets of invention on Boyd's original lie, exciting the hopes of families who lost loved ones in the war that husbands and brothers and sons may be among the fictional survivors. One woman's excitement so overwhelms her that she suffers a fatal heart attack, and mobs eventually converge on Boyd's home, demanding the identities of the survivors be revealed. In time, Bachmann realizes that the story is a lie and he must make the difficult choice of either covering up the deception, or telling the truth and losing his career in the process. In either case, he suffers a rude awakening in regard to the journalist who had become his hero and role model. There is a romantic subplot, but it is fairly prudent apart from some allusions to Boyd's non-avuncular interest in his young niece. Horst Buchholz and Maria Perschy both passed away fairly recently -- Bucholz in 2003 (pneumonia) and Perschy in 2004 (cancer). Neither of them lived to reach the age of 70, which makes it a bittersweet and sentimental pleasure to find them here looking so young and full of promise. 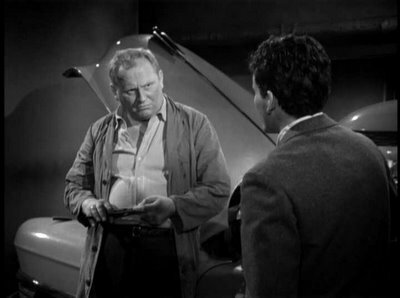 Even Gert Fröbe looks fresher than usual; this was a couple of years before Fritz Lang cast him as Inspector Kraus in THE 1000 EYES OF DR. MABUSE [Die Tausend Augen des Dr. Mabuse, 1960], thus setting his career on track toward the immortal role of Auric Goldfinger. The film is stolen, however, by Martin Wald as Cesar Boyd, a robust actor who wasn't destined to enjoy the same level of international recognition as his co-stars. The director of photography, Helmut Ashley, later became a director specializing in krimis -- notably the excellent Moerderspiel ("Murder Game," 1961) and the Edgar Wallace film Das Rätsel der roten Orchidee ("The Puzzle of the Red Orchid," 1962, starring Christopher Lee). Dark Sky's disc is correctly rendered in standard ratio and looks pretty good except for some early shots that evince some noise and shimmer as the camera casts a look down a cobblestone road. I wish the disc offered a German language option with English subtitles, to help one get closer to the performances; nevertheless, the quality of the dubbing is excellent. The voices and dialogue doesn't always fit the lip movements, but the voice actors give valid performances and the English track feels unusually wedded to the film. If you're looking for something offbeat, an unusual evening's entertainment that gestures to a whole other world of filmmaking you're not likely to know much about, consider taking a midnight stroll down WET ASPHALT. Here's hoping that Dark Sky unearths some more "Lost Noir"! There must be more where this came from.